Come to Calcutta a month before Durga Pujo and this laidback city will be bustling with an energy not seen otherwise. Maybe it is the beginning of pujo shopping or the excitement of pandals finally taking shape or restaurants coming up with pujo special menus. Pujo is in the air. Even conversations in buses and trams start with an excited 'Maa Aschen'. No other festival anywhere in the world can compare to the grandeur of Durga Pujo! Pujo isn't so much about worshipping the goddess than about celebrating her homecoming. Athiest or believer, every Bengali celebrates pujo with equal gusto. It isn't the time for fasting, but unleashing gluttony - mutton chop, fish cutlet, biryani, egg roll and everything non-veg. It is the time for adda and pandal hopping in our best clothes! Dressing up during Durga Pujo is serious business for us Bengalis. We like to have our outfits planned for all the Pujo days. So this Durga Pujo, Anupriya of Style Prism and I have created a festive lookbook in collaboration with Howrah Bridge by ADG. I couldn't think of a better time to talk about my favourite Calcutta brand than during Pujo, especially now that I'm committing to buying less and buying local when need be. What is more Calcutta than naming your brand Howrah Bridge? Howrah Bridge by ADG serves you the best of Calcutta and Bengal through her clothes and knick-knacks. It is Indie clothing at its best. From kurtas to dresses to handloom sarees and tops and blouses, it is earthy clothing with a hint lot of quirk. There is something about romanticising the past, no? Frilly sleeves, polka dots, vintage florals and cat-eye glasses! Durga Pujo fashion is more than a laal paar saree with red bindi. Pujo does not have to mean saree or traditional outfits. Opt for retro dresses in Indian prints. For our Saptami look, Anupriya wore a Howrah Bridge Vintage Floral Dress with wooden cat-eye sunglasses and pom pom kolhapuris while I opted for an Ikat Frill Dress with chunky earrings grunged up with oxfords. Ashtami is for sarees. You cannot go through Durga Puja without wearing a saree on at least one day! But ditch the regular blouse and wear your handloom saree with a boxy blouse or a kurta. Durga Puja is Bengal's fashion week! Keep it light and casual on Nabami with a shirt dress quirked up with a wooden bow tie or bring out your Boho goddess in a cold shoulder maxi dress and scarf worn as a head wrap. 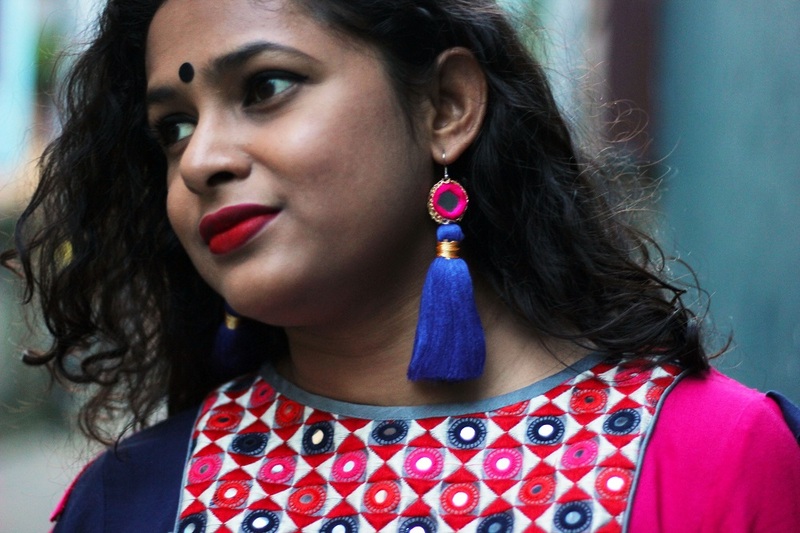 Bid adieu to Ma in an asymmetrical kurta or patchwork dress accessorized with tassel earrings! If you want to order any of the clothes from this lookbook, please get in touch with Anupriya on howrahbridgebyadg@gmail.com. Everything can be custom made for you the way you want. Read Anupriya's Durga Pujo Story.